If you’re at all into researching candy itself rather than just eating it, then you might know that the manufacturer of delicious Peeps candy is Just Born, a candy company founded in 1923 and headquartered in Bethlehem, Pennsylvania. What you may actually not know is that Just Born actually makes other candies! 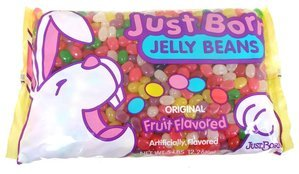 We’re going to highlight one of those candy types this season for Easter: jelly beans! This type of Just Born candy is perfect for Easter due to all of its delightfully festive colors. The standard variety consists of multiple fruit flavors, while you can also get multi-colored jelly beans in spice flavors. Those are for the more adventurous ones among you. Last up for the jelly bean Just Born candy, we have black licorice jelly beans. Now you won’t have to go searching through a bag of assorted beans, saving all the black licorice ones for yourself. With these, you get 10 ounces all for you! Or, if you feel inclined to share, you might want several bags. If Peeps are all you’ve ever known of the Just Born candy collection, you owe it to yourself to try out some more of their Easter candy this season. Trust us, you can’t go wrong with Just Born candy, especially at Easter time. Explore all of our Just Born candy right now by going to BlairCandy.com!